California, An Environmental Leader, Eyes A Key Role In Climate Talks World leaders are set to meet in Paris, trying to agree on how to combat climate change. Also attending will be California Gov. Jerry Brown, who is spearheading his own international climate movement. Gov. 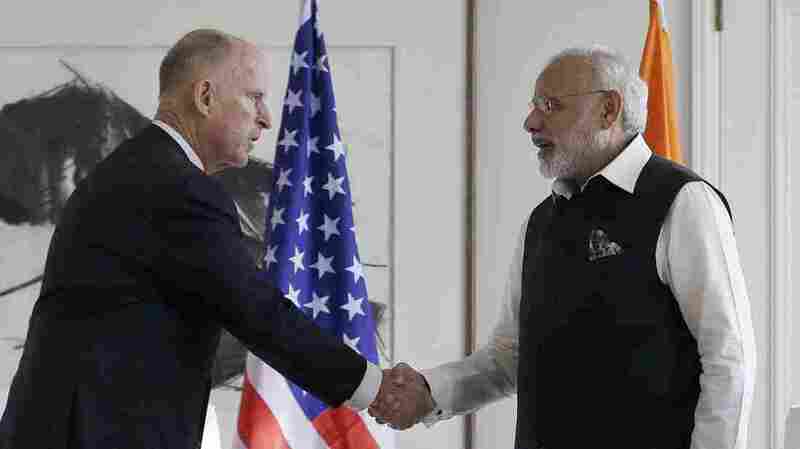 Jerry Brown (left) meets with Prime Minister of India Narendra Modi in San Jose, Calif., on Sept. 27. Brown has been brokering his own international agreement on climate change. And he met with Chinese leaders in September. The reason for all these meetings? "Troglodytes," he says. That's what Brown calls those who doubt climate change. "The Republican Congress and all of the Republican candidates are in very deep state of denial despite the vast, vast overwhelming scientific consensus," he says. Brown says the political stalemate in Washington, D.C., has left a huge void on climate change. "Somebody has to wake up the country to the real danger," he says. And that somebody is California, he says. Brown has been brokering his own international climate agreement — not with other countries, but with regional governments, including states and provinces in Brazil, Germany and Mexico. They've agreed to cut their emissions 80 percent or more by mid-century. "That's more than the nation-states," he says. It's not a binding promise to cut emissions. But Brown says the more than 50 signatories represent what would be the largest economy in the world. And he's bringing their message to the Paris climate conference. "We have to light the fire, if I could use that metaphor, putting as much pressure and support behind this global commitment," he says. Going it alone is something California is used to. A decade ago, the state took on a landmark climate change goal, to cut emissions 30 percent by 2020. It's the most ambitious policy in the country and it's remaking California's economy. 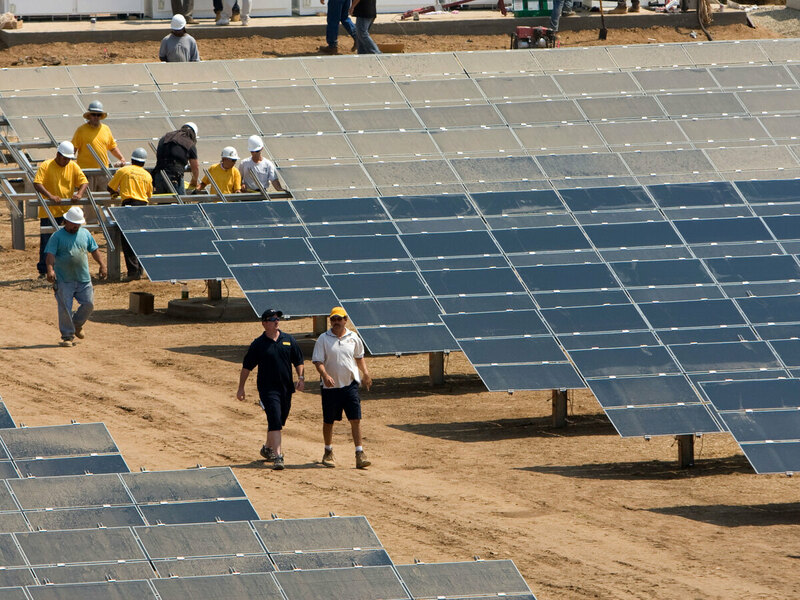 Workers install a solar farm outside Sacramento, Calif. The state aims to attain half of its electricity from renewable sources by 2030. Record amounts of renewable energy are coming online, like a 16-acre solar farm opening outside Sacramento. Manufacturers and electric utilities have had to cut their emissions, too. And then there are California's cars. Automakers are required to offer hundreds of thousands of clean cars for sale on the California market, like the all-electric Nissan Leaf that Jeff Stone parks at his Southern California office. "I gotta tell ya, I love the car," he says. Stone is what you'd call an early adopter. This is his third electric car. "I had a Tesla that I loved. And then I had Coda," he says. Stone is also a Republican state senator and a climate change doubter. He's not a fan of California's go-it-alone approach. "We represent about 1 percent or less of any contribution to global warming that happens. And we can't do it alone," Stone says. That may be true, says Dan Kammen, a professor of energy at UC Berkeley. But he thinks California's real power is as a symbol. "California's the seventh-biggest economy in the world. It makes a big difference and it's a big thought leader," Kammen says. He points out that today's federal rules for energy efficiency and car pollution are based on California's. "And so getting a lead actor like California really helps the federal government see what the options are, see what the hurdles are likely to be," he says. Which is why Kammen says he talks about California non-stop at international climate meetings. He'll be joining Gov. 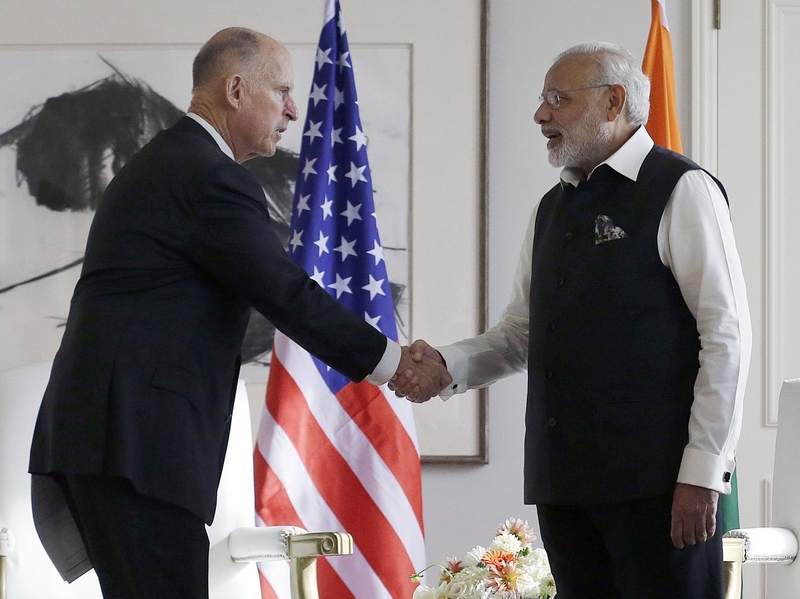 Brown this time in Paris, as California looks to make its mark on the world stage.